All orthodontic services are provided by a specialist. From regular braces to clear braces, simple crowding of teeth and space management, as well as more complicated crowding issues can be treated in office. Procedures involving jaw surgeries are done in conjunction with an oral surgeon. Our office uses innovative SPEED braces. These are like traditional metal braces, but they have a special “super-elastic” metal clip that is designed to deliver precise, yet gentle and continuous forces to your teeth. Unlike the elastics that are required to hold wires into traditional braces, the special metal clips do not fatigue over time. Even better, these braces are typically about 1/3 smaller than traditional braces which results in less food trapping and easier hygiene. The end result is a precise, comfortable, and efficient treatment! For those patients preferring a more subtle and aesthetic option, ceramic braces are the clear choice. You can still take advantage of the benefits of self-ligating technology, combined with the transparent look of braces made with a specialized ceramic. Our “clear” braces combine the esthetic benefits of ceramic with the advantages of a self-ligating system! Invisalign® is a system made of tailor-made, clear aligners that can replace traditional or ceramic braces in the right cases. 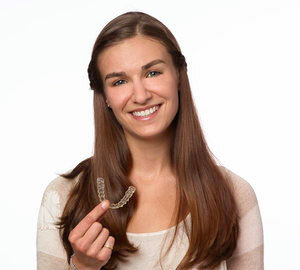 The aligners are made of smooth, almost invisible plastic that will gradually and gently shift your teeth into place. The aligners are changed approximately every two weeks – patients love the convenience, comfort, and ease of oral hygiene that this type of treatment can provide. Reach out to us today to learn how Dentistry @ Merritt can help you! A discussion with our receptionist will get you all the information you need to make an informed decision. Ask questions, get information, setup a consultation, or book your appointment! Feel free to reach out to us by phone, email, visit our practice or use the quick contact form below. We promise to get back to you as soon as possible and aid you through the process!